The biggest game of 2016, Overwatch, meets the biggest toy trend of 2017. 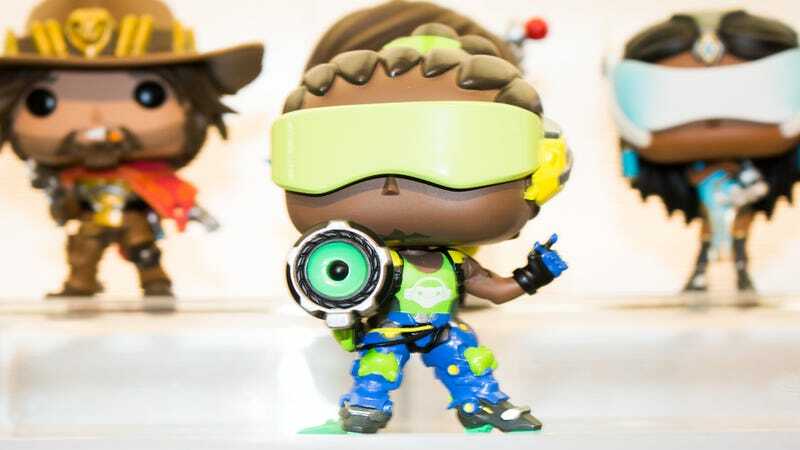 The New York Toy Fair is a showcase for the latest and greatest playthings hitting store shelves in the coming year, but it’s also a good indicator of where the toy market is heading. In 2017, that’s directly to the inexpensive collectibles aisle. Much of my Toy Fair coverage centered on the basics. Action figures, building toys, video game-themed items, expensive Japanese imports and the odd doll or two—these are the items I feel most resonate with our audience. But in the grand scheme of things, those old favorites are a small fraction of what was shown in the halls of the Javits Convention Center this year. This piece originally appeared 2/24/17. You don’t see many brand-new action figure lines popping up these days, at least not from major players like Hasbro or Mattel. For them it’s about the licensed properties. Why take a gamble on something completely new when you’ve got brands like My Little Pony, DC Comics, Marvel Comics, Transformers, Pokemon, and the like? Even a niche player like McFarlane Toys, which used to do a brisk trade in original horror works (my wife has some truly unsettling examples), had a booth filled with Mass Effect Andromeda, Destiny, South Park and Rick and Morty figures. McFarlane’s take on Mass Effect Andromeda. These days the original action figure lines are being made by small independent companies, many of which fund their lines via crowdfunding on sites like Kickstarter or Indiegogo. Though it’s always been a huge factor, licensing was king at this year’s Toy Fair. Even Playmobile, a company that’s spent decades creating original iconic works, is tapping into the licensing pool this year with Ghostbusters and How to Train Your Dragon building sets. But where property licensing really kicks into high gear is in this year’s biggest trend: small, inexpensive collectibles. You see them everywhere. The Pop! Vinyls from Funko. The blind bag figures from Toy Robot. The colorful boxes taking up an ever-increasing amount of shelf space at retailers like Target and Walmart, or slowly supplanting video games as the most prevalent product at GameStop (it says “game” right in the name). Bob’s Burgers blind box figures from Toy Robot. According to the NPD group, as quoted in the Toy Industry Association’s “Top Toy Trends Of 2017" press release, the collectibles market grew by 33 percent last year, with some $1.8 billion in sales. I’m positive that already substantial number is going to be larger in 2017. One of the biggest factors in the success of collectibles is cost. Generally priced somewhere between $3 and $10, it’s much easier for a parent or adult toy enthusiast to justify picking up a couple of plastic or vinyl figures versus spending $10 or more on a larger toy. Plus, in the U.S. we’re at a point where many of us have no clue where the economy is going to go over the next four years. Buying small instead of big offers comfort in such situations. In the case of blind bag figures, there’s also an element of gambling involved. Instead of showing what’s inside the package, each blind bag has a chance to contain any number of figures in a fixed assortment. And should a fan not get the figure they want, buying another blind box is almost reflex. If the collectibles trend continues, expect Toy Fair to be completely subjugated by the Funko booth by 2020, while Gund, Mattel, Lego and Hasbro are forced to set up along 11th street. Every toy store shelf three years from now? Please don’ let this trend continue. Tech Teachers: Along with traditional learning toys focusing on subjects like math, science and reading, edutainment products aimed at teaching children advanced technical disciplines such as programming and robotics are still on the rise. From the basic game design teachings of Mattel’s Bloxels to play kits from companies like Robotis, toy makers are working hard to ensure our children are much smarter than we’ll ever be. 3D Printing: I’ve been playing around with a 3D printer for a feature for a couple of months now, New Matter’s MOD-T to be exact, and the possibilities for kids and toy collectors alike are endless. While New Matter didn’t make it to Toy Fair, several other companies were on hand to show how easy and affordable the technology is getting. Soon we’ll never have to go to eBay for a missing robot gun again. Wooden Expressions: While vinyl and plastic still rule the collectibles roost, a growing number of companies are creating lines of colorful characters made out of wood, AKA nature’s vinyl. Cryptozoic’s Mighty Meeples line of tiny licensed wooden figures is going strong this year, and they’ve added a new line of totem-looking figures called Teekeez, featuring Batman characters. Collectible maker Bif Bang Pow! introduced its own wooden line at Toy Fair with Pin Mates, which look like they were carved from clothes pins. It’s not a very good year to be a tree. Puppets! : This is just wishful thinking. I really like puppets. There weren’t a lot there. So that’s a look at where toys are going in 2017. Keep in mind it’s a very broad look. While we may be flooded with inexpensive collectibles and licensed knick-knacks this year, the darker corners of the toy stores will be filled with all sorts of wonderful ways to amuse and educate our children and ourselves.